Veeam Cloud Connect allows users of Veeam 8+ to assign Tier II storage as a repository for off-site data vaulting and backups. 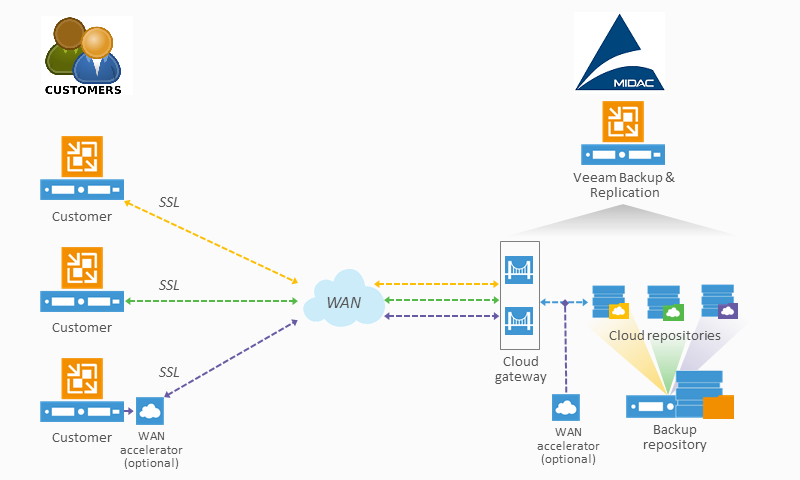 This allows you to keep a scheduled or continuous backup of your virtualized machines on MIDAC’s cloud infrastructure. Once backed up, you can restore individual files or whole virtual machines back to their local environments when needed. With three strategic data centers, you can be sure that your data is kept safe, secure and in Canada. Veeam Cloud Connect removes the two main hurdles that such a service required in the past: VPN Tunnels, and dedicated repositories. VPN is not easy to be configured automatically, and usually requires an interaction between the service provider and the customer. With Veeam Cloud Connect, the connection will happen directly over the Internet, using a single TCP port, protected by SSL encryption. This is achieved through a new Veeam component called the ‘Cloud Gateway’, which is responsible for the encapsulation of all the backup traffic inside the SSL tunnel.